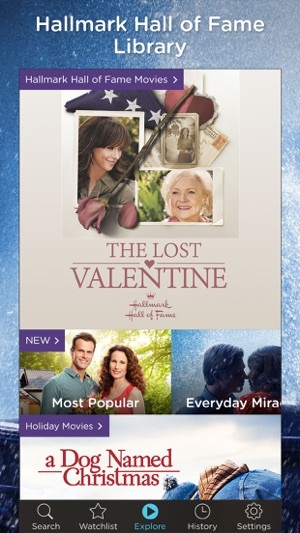 Watch Hallmark Hall of Fame movies, original movies, series and specials from Hallmark Channel and Hallmark Movies & Mysteries, and Hollywood favorites—all commercial-free for as low as $4.99/month. It’s easy to get started! 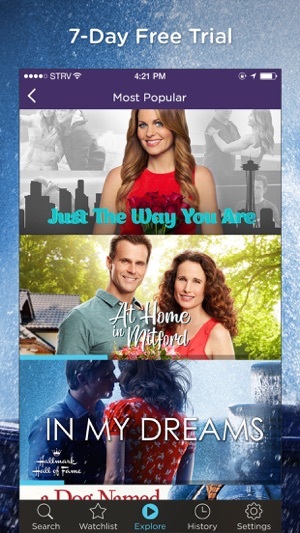 Just Download Hallmark Movies Now, start your 7-DAY FREE TRIAL, and start watching instantly on your iPhone, iPad and Apple TV. 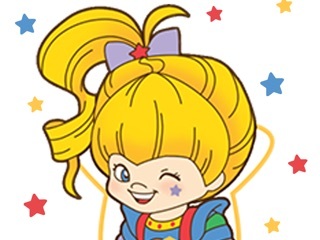 Your subscription will be charged to your iTunes account at the end of your free trial and will automatically renew unless auto-renew is turned off at least 24 hours before the end of your current period. Your iTunes account will automatically be charged at the same price for renewal, as stated above, within 24 hours prior to the end of the current period. 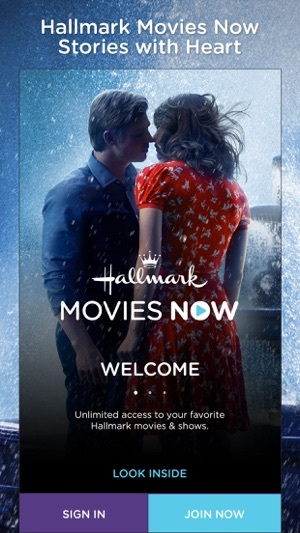 Hallmark Movies Now is part of Crown Media Family Networks, a wholly owned subsidiary of Hallmark Cards, Inc.
We've made changes to Hallmark Movies Now designed to make your viewing experience more enjoyable. Please contact us at support@hmnow.com if you have any problems and we will gladly help you. I love this app. I have seen so many reviews and comments about the content being older, but what do you expect? 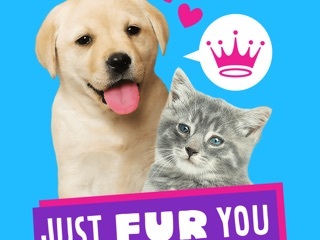 Why would Hallmark have their newest shows and movies on an app? Other networks do the same thing, it’s a business, which I understand. I love catching up on movies and shows I have not seen in years. It is absolutely worth the price, but probably won’t keep it long because there is so little content, it will not take long to get through what I want to watch. But no contracts so it is worth it!! I would love to see older tv shows on here, much like Sue Thomas. There are other family shows I would like to see them purchase and have on here, like Doc and Promised Land. They could offer more of their older movies, but they have a decent number of them. My only complaint is around functionality. It does not save the place where you left off watching a show so you have to scroll through to remember what episode you were on. It also fast forwards and rewinds weird. It skips over huge blocks of time and you cannot see scenes as you’re going so hard to find the specific spot you want. I have had it crash a couple of times, too. So far it always reopens, but it looses my spot and finding it again is hard with the way it fast forwards. Again, totally worth the money even though it has room for improvement. We are working on cutting the cord and it is hard to find a way to watch current offerings on Hallmark or especially Hallmark Movies and Mysteries channels. I mistakenly thought this would be my answer. Don’t be drawn in if you want anything current. Some of the series are so old that even the picture quality is bad. I love all the mystery movies offered on their Movies and Mysteries channel on cable, but they are nowhere to be found on this app. Another major problem is how clunky the app is. If you start a series, and there are many episodes, it doesn’t pick up where you left off! It takes you back to the start of the series every time, so you have to try and remember which episode you are on. This might not seem like a major problem unless you are elderly and have memory problems, and struggle with using technology, like my mother does. 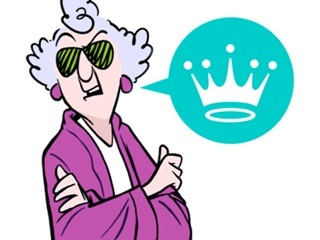 She is the main reason I subscribed to Hallmark Now, and it is totally worthless to her the way it is set up. I wish I had not subscribed to a full year. She cannot watch it unless I am there to help her every time, unlike Netflix and other apps that automatically pick up on the episode you are ready for. I did try to explain this problem to those who are there to help, but they didn’t seem to understand my problem at all. There doesn’t seem to be any help for this. Has anyone else had this problem, or is there something I am missing? 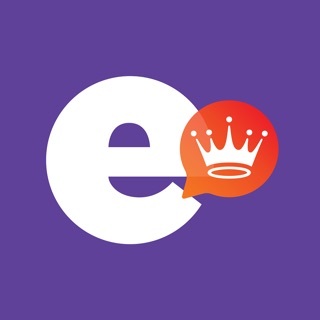 The app is great and functions well. Easy to navigate, sometimes glitches when I go from watching on my phone to watching on my computer saying I’m watching on more than one device even if I closed out on the other device. Other than that no issues on function. I love watching Christmas movies and came here for just that. I signed up last year and was EXTREMELY bummed to learn that the new countdown to Christmas movies were not on there. This year I’m even more bummed to learn that last years movies are not on there and there are barely any new movies from what was on their last year. I wish that you would do one of two things. 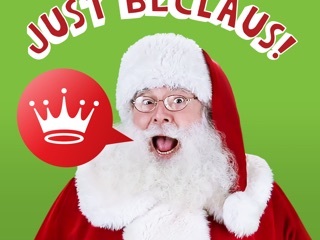 Add more new Christmas movies to the movies and mistletoe section or make a movies and mistletoe app so we can pay for just that. I’m even ok if I have to watch them a year behind but currently I don’t get to watch any of them at all and I don’t think that is fair for 5.99 a month. I would love to hear back from someone about this. Thank you for your time in reading.